The Russian Foreign Ministry has given its approval to American diplomat John Tefft’s appointment as the new ambassador to Russia. According to Russian political scientists, the career foreign service officer is known for his anti-Russian position - so how will his appointment affect political relations with the U.S.? The Russian Foreign Ministry has formally approved the appointment of American diplomat John Tefft as the new U.S. ambassador to Russia. 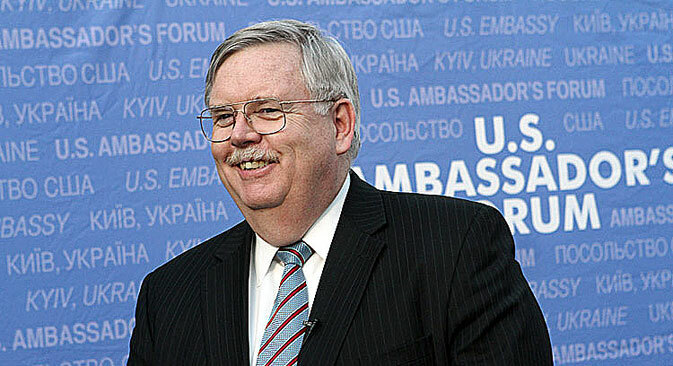 The choice of Tefft is controversial in the context of the current political climate: As the ambassador to Georgia and Ukraine, he strengthened American ties with those countries and oversaw a deterioration in relations with Russia. The newly appointed U.S. ambassador to Russia has said on more than one occasion that Ukraine needs to minimize its energy dependence on Russia. A U.S.-Russia working group on energy security was created in 2009, and a memorandum of understanding was adopted in 2011 to allow U.S. geological surveyors to work in Ukraine. Shale gas reserves were discovered in the country, and Hunter Biden, the son of U.S. Vice President Joe Biden, was appointed to the board of directors of the largest private gas producer in Ukraine, Burisma Holdings. According to an analysis by the Russian Center for International Journalism and Research, John Tefft was actively involved in preparing the driving force behind the Euromaidan movement in Kiev. “The activities of the U.S. Agency for International Development and numerous American private funds flourished during his tenure as ambassador from 2009 to 2013. Tefft in particular was a regular speaker at TechCamp, where participants were trained to use digital technology to mobilize protest sentiment,” reads the analysis. “As a specialist in post-Soviet latitudes, Tefft is well versed in the particularities of the corrupt apparatus of our countries,” Ukrainian political scientist Vadim Karasev told RBTH. “As the ambassador to Ukraine, he understood the Ukrainian business elites perfectly, and he managed to establish good relations with the key Ukrainian magnates, on whom the country’s political life depended. The Americans always had decent relations with [former Ukrainian] President Viktor Yanukovych. There were more than a few Americans among his advisors, and Tefft was his person in the presidential administration,” Karasev said. Tefft’s term in Ukraine coincided with the drafting of Ukraine’s ill-fated first Association Agreement with the European Union. Prior to September 2013, Kiev had given no reason to doubt that the agreement would be signed. However, in November, Yanukovych scrapped his intentions to sign, and then a full-scale political crisis broke out in Ukraine, which remains unresolved. All of this happened after Tefft left his post. According to Deputy Dean of the Institute for U.S. and Canada Studies at the Russian Academy of Sciences, Valery Garbuzov, the choice to appoint Tefft as the new ambassador symbolizes the anti-Russian fervor raging in Washington and Barack Obama’s stated commitment to completely isolate Russia politically and economically. The last blog of the U.S. Ambassador to Russia. “Tefft’s tenure coincides with the remaining period of Obama’s presidency. The diplomat will continue the chosen course of isolating Moscow in the world. However, the chances of such a policy being successful are slim, because European business is deeply connected with Moscow, and China knows how to separate economics and policy,” Garbuzov said. The Center for International Journalism and Research draws a rather grim picture of the future of Russian-American relations. According to its analysis, Tefft will primarily act outside of the public eye. Washington’s line will remain the same: regime change in Russia, particularly with the use of the Ukrainian “resource” that the U.S. has created. However, in light of Russian public consciousness in recent years and the mobilization of popular support against the backdrop of the Ukrainian tragedy, Tefft’s task in Russia becomes slightly overwhelming. “This is an extremely rare case in diplomatic practice. This step gives a very strong and hostile signal from the government sending the ambassador, and it would be pretty difficult to refuse to approve Tefft’s candidacy in today’s political environment,” General Director of the Russian Council on International Affairs Andrei Kortunov said. In his opinion, it would be hasty to expect Tefft to produce major changes in the U.S. approach to relations with Russia, given that the course is set by the White House and President Obama, not by the ambassador himself. Tefft will not make any big mistakes, and he will behave cautiously so as not to provoke any doubts and suspicions among the Russian government, said the council director. “Now, it seems, the question is how much room the new ambassador will have for maneuver. Will he have the opportunity to communicate with a wide range of Russian politicians, officials, and public leaders?” Kortunov said. “If Tefft’s circle of contacts is limited, then by all appearances, opportunities for dialogue on bilateral relations will also be limited,” he concluded.